A combination of fierce competition and digital disruption has fostered an agile test-and-learn approach to travel marketing – with record-breaking results. From adopting a risk taking mentality to developing mobile first strategies, here are four things to learn from travel marketers. Being part of an industry that has experienced unprecedented levels of disruption over recent years, travel players have had to embrace digital transformation to remain competitive. To serve its 120 million customers, Ryanair has invested in digital and the functionality of its app to take a mobile-first strategy. Over Christmas the airline saw a significant jump in the number of consumers opting to use its mobile platforms. Although app and smartphones would typically represent 55% of traffic, on Christmas Day this figure rocketed to 90%. Jacobs urges marketers across the board to move faster into the digital space. “Just get on with it. Make sure you’re building in an agile way and that what you are creating now you can build on later,” he says. “Also work harder to stand for one thing. Too many industries say ‘we want to be best on price, choice, digital, quality and service’, and I would say good luck with that pursuit. We have embraced digital faster than anybody, but we still stand for price,” adds Jacobs. Reimagining the travel booking process with a mobile-first strategy was the plan when Virgin America launched its new app in September. The intuitive design incorporates bespoke animations and curated Spotify playlists for each destination. The app also offers a personalised 60-second booking process based on the user’s previous travel history. Abby Lunardini, Virgin America vice-president of brand marketing and communications, believes the dramatic rise in mobile booking and trip planning is responsible for driving innovation in the travel experience. 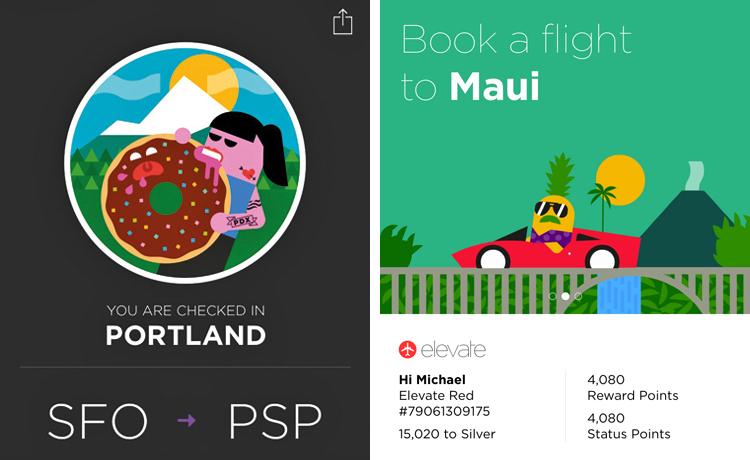 Virgin America’s new app offers a personalised 60-second booking process based on the user’s previous travel history. “Given the significant growth in mobile booking we wanted to make the app a concierge during your trip, but one that also provides a seamless and super-fast booking experience,” says Lunardini. Given the shift to mobile booking it is hardly surprising that Google has claimed a large chunk of the travel space. In September, the tech giant launched Trips, a reservation app that utilises information from the user’s Gmail account to automatically populate reservations for hotels and trips. The app is designed to complement Local Guides, a platform where users receive points for sharing interesting locations and reviews on Google Maps, which entitle them to early access to new products or events. According to Google travel industry head Terri Scriven, the company is benefitting from the 85% of leisure travellers who use their phone as a concierge to book activities, combined with better free Wi-Fi connectivity and lower roaming charges. “I do believe innovation has been driven by the intense competition in travel: competition for travellers’ eye balls and [the need] to make the booking [process] smoother, more convenient and hassle-free,” says Scriven. “Travel companies have made a concerted effort to improve their mobile sites, especially over the last year as approximately a quarter to a third of travel is booked on mobile, depending on the market. From a travel perspective, Google expects machine learning and artificial intelligence to be an important focus in 2017, when Google Assistant will be able to book travel through a smartphone, Google Allo messaging app or Google Home device. Gone are the days of travel companies specialising in just one part of the journey. Now players keen to widen their influence are broadening their product portfolio to tap into the experience economy. Last November, Airbnb moved beyond pure accommodation with the launch of Trips, tailor-made city tours and experiences designed by local hosts and accessed through the app. Virgin Holidays vice-president of marketing Claire Cronin expects players across the travel sector to react to Airbnb’s move into experiences by adopting new positions within the ‘holiday journey’. However, to manage the journey from end to end they will need to embrace digital innovation, says Cronin. She expects to see more travel companies using chatbots and artificial intelligence to manage the experience overseas 24/7. Ryanair’s Jacobs believes the airline’s commitment to digital transformation has given it scope to move the business into package holidays, playing into the consumer trend for one-stop shopping. The strategy for 2017 is to be like Aldi when it comes to price and choice, be like Amazon when it comes to digital and move faster than anyone else. According to Jacobs, Ryanair has an advantage as consumers usually book flights before the rest of their holiday, giving the airline the opportunity to cross-sell accommodation, upgrades and transfers to the 100 million people who visit its website each year. To develop an end-to-end strategy Ryanair has launched business and family products, while maintaining its low-price positioning. “It’s about low fares, but we have knocked off the rough edges,” says Jacobs. “We have become much more acceptable as a brand of choice for business travellers and families. That improved accessibility meant it’s the right time for the Ryanair brand to start selling holidays, rooms and transport. Described as its ‘most ambitious brand launch’ to date, Virgin Holidays’ ‘Seize the Holiday’ campaign and record breaking live TV advert beat off 15 rivals to scoop Marketing Week’s ‘campaign of the year’ competition, as voted for by readers. Featuring live footage of Virgin Holidays’ customers shot simultaneously across 18 holiday destinations worldwide, the advert resulted in 16.9 million Twitter impressions and 838 web searches per minute when it was broadcast during ITV’s X Factor on 10 September. The use of live customer-generated content reflected the campaign’s focus on showcasing ordinary people doing fantastic things, explains Cronin at Virgin Holidays. The risk paid off. During the screening Virgin Holidays saw the highest ever volume of traffic visiting its website in its 31-year history, which has only been equalled by its current peak trading January sale campaign. Seize the Holiday resulted in a 15% uplift in sales year on year between September and October. Compared with the 2015 average, Virgin Holidays experienced an 8% uplift in spontaneous awareness and 6% increase in brand preference as a result of the campaign. 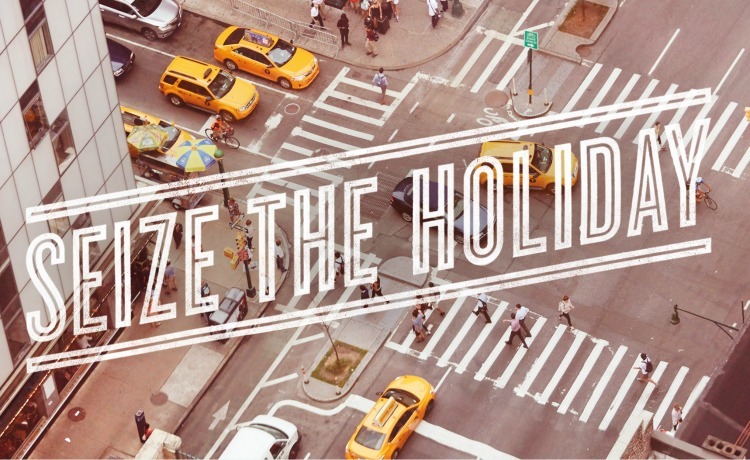 Seize the Holiday also drove a 5% uplift in brand preference compared with the release of its ‘Unleash your Mojo’ campaign in 2013. “We smashed all of our metrics in terms of getting more enquiries and people booking with us. We know January is the biggest booking window and so we really wanted to plant the seed in September,” explains Cronin. Cronin believes the advert generated such an “unprecedented” response because it strikes a cord with consumers’ “screw it, let’s do it” attitude in the wake of the Brexit vote and Trump’s successful bid for the US presidency. In the current climate it is more crucial than ever for marketers to be disruptive, especially in the travel sector where competition is fierce and margins are thin, says Cronin. She argues that to stand out from the pack, marketers in other sectors need to be less afraid and stop relying on using data to prove their arguments, which can dilute their ambition. There are very few industries where you get such a level of buy-in across the board to take big risks. “Post-recession there has been a dearth of creativity. Marketers have become afraid to take creative risks and they have become very predictable and safe in the plans they take to market because they want to create something they think will get buy-in from the chief financial officer,” she says. Making the customer the hero of the story was the strategy behind Marriott International’s latest campaign, created to coincide with the hotel group’s acquisition of Starwood Hotels and Resorts Worldwide in September. Primarily aimed at explaining to customers the ability to transfer Marriott Loyalty points across the group’s portfolio of 30 brands, the ‘You are Here’ campaign was shot on location with real loyalty members telling stories of their experiences at hotels across the group. As well as longer-form online content pieces, TV adverts aired on CNN worldwide on New Year’s Eve and on other primetime slots during the autumn. Marriott also experimented with Facebook’s immersive video platform Canvas to extend the story on social media. One video showing a marine biologist loyalty member at the Ritz Carlton Grand Cayman resort rated 25% higher than the industry benchmark for time spent viewing an online video. “Travel lends itself to storytelling and we think our members are really great storytellers to collaborate with,” says Marriott International global marketing officer Karin Timpone. Going forward, Marriott has plans to greater utilise the content studio within its global marketing department to create more immersive digital storytelling. Timpone argues it is critical for marketers, regardless of sector, to test a variety of digital platforms and think about how their brand story belongs in real conversations. Whether it is embracing a risk-taking culture, taking a digital focus or becoming a storytelling brand fuelled by user-generated content, there is a lot to learn from marketers in the travel sector.